Over 2,000 activists have been detained since protests began in Khartoum on June 16, the activist group Girifna reported, prompting mounting international criticism and spurring more solidarity from Sudanese opposition groups. The National Intelligence and Security Services, or NISS, began cracking down heavily on activists and journalists starting June 22, dubbed “Sandstorm Friday,” when hundreds of Sudanese took to the streets after the Friday prayers, protesting against the brutality of President Omar al-Bashir’s 23-year-long regime and his failed economic policies. The U.S. State Department released a statement on July 10 condemning the Sudanese government’s violent response to peaceful anti-regime demonstrations. The statement was issued following reports that security forces are using tear gas, rubber bullets, and arbitrary arrests against peaceful protestors. "We call on the Government of Sudan to halt the violence and respect the universal rights and fundamental freedoms of its citizens, including freedom of expression, freedom of the press, and freedom of assembly," the State Department statement read. NISS agents have made a concentrated effort to arrest prominent activists and intimidate protesters. On July 3, activist Rudwan Dawod, whose family lives in Oregon, was arrested while participating in a nonviolent demonstration. Dawod was charged with “criminal organization and terrorism,” which in some cases results in the death penalty. Women activists have also faced arrests and long-term detentions. Girifna member Rashaida Shams al-Deen was arrested on June 23, and has yet to be released. Girifna notes that long-term detentions for women activists are unprecedented in Sudan. But NISS agents are not only targeting youth and student activists. Older activists and politicians have also been detained. On July 7, the political secretary of the opposition Popular Congress Party, Kamal Omar, was arrested at his home. His son, Omar Kamal Omar, was arrested two weeks earlier in an attempt to threaten the opposition leader. 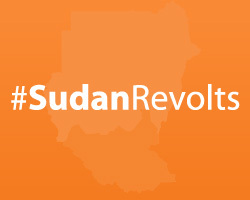 The Sudanese group Sudan Change Now is compiling reports about various forms of violence across the country and tracking incidents on an interactive map. The State Department urged Khartoum to investigate these acts of violence and arbitrary arrests. The E.U. and Canada have also expressed concern at the detention of journalists and political activists. But the Sudanese government has been unresponsive to these concerns, denying the detention of activists and stressing that the police is in control of the situation. However, NISS agents continue to use tear gas and rubber bullets to disperse protesters, and thousands of activists are still being detained. Despite this intimidation, protesters continue to organize. Activists announced that they are preparing for another peaceful demonstration on Friday, July 13, dubbed “Kendake Friday.” Kendake means ‘strong women’ in the Cushitic language, and the protest aims to honor the role of women in this recent wave of protests and in Sudanese society. Opposition parties have also thrown their support behind these protests. Major parties like the Umma Party and the Popular Congress Party have unified in support of these protests, a move which some analysts cite as a sign that these protests may mark the end of Bashir’s oppressive regime. Opposition party leaders are urging the Sudanese to ride the “wind of the Arab Spring” and take to the streets in peaceful demonstrations.